Preheat oven to 375 degrees. Microwave the squash for 1 minute. Cut off the stem, then cut lengthwise down the middle. Remove the seeds. Place cut side down on a baking sheet and bake for about 20 minutes then flip to cut side up and bake for another 20 minutes, or until the squash is tender. Meanwhile, place a skillet over medium high heat. Add in the ghee and beef and sear until mostly cooked. Remove beef from skillet and place on a plate. To the skillet, add the onion, mushrooms, and garlic. Pour in the red win vinegar and deglaze the skillet by scraping the bottom of the pan with a spatula. Cook until onions are translucent. In a separate bowl or measuring cup, whisk together milk, mustard, and agar agar powder until powder is dissolved. Once onions and mushrooms are cooked, add the beef back to the skillet and pour in the milk mixture. Sprinkle in paprika and red pepper. Cook on medium until sauce has thickened, about 10 minutes. When spaghetti squash is ready, shred with a fork to form noodles. 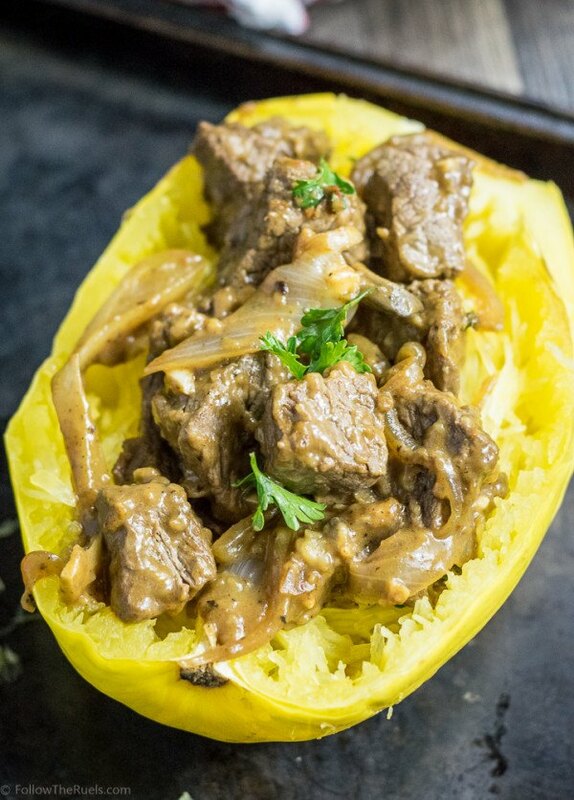 Spoon beef mixture on top of spaghetti squash. Top with parsley.